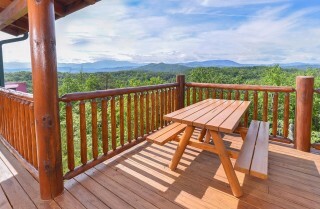 Spend your summer vacation grilling on the deck with impressive views of the Smokies all around, your holiday getaway around a gas fireplace with stacked stones reaching all the way to the ceiling, and your family vacation playing arcade games, air hockey, foosball, and pool together or relaxing by the new fire pit! 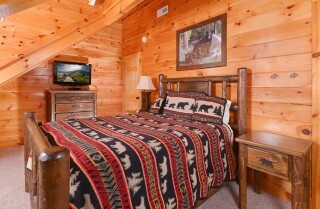 This large-group cabin for 25 boasts space and amenities, making any group getaway a memorable one. Inside, you’ll find 7 bedrooms and 5 bathrooms as well as a large, comfortable living room where you can relax with your group whether you’re visiting for a special occasion, a family reunion, or a corporate getaway. When you want to relax, climb into an outdoor hot tub, soak up awesome mountain views from your back deck, or have movie night in the cool theater room! Of course, when you are ready to explore Pigeon Forge, you’ll have tons of things to do -- just a few miles away. 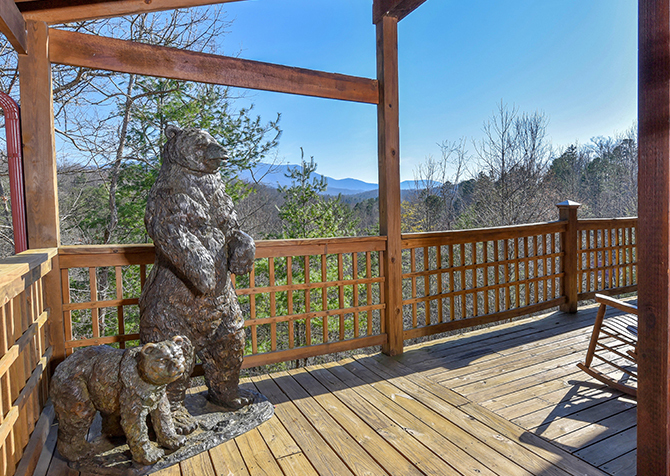 You can try one of the dozens of great restaurants, go outlet shopping, or check out hands-on, family-friendly attractions like WonderWorks and the Titanic Museum Attraction. Pigeon Forge is full of group activities to make your large-group excursion to the mountains exciting and full of fun. 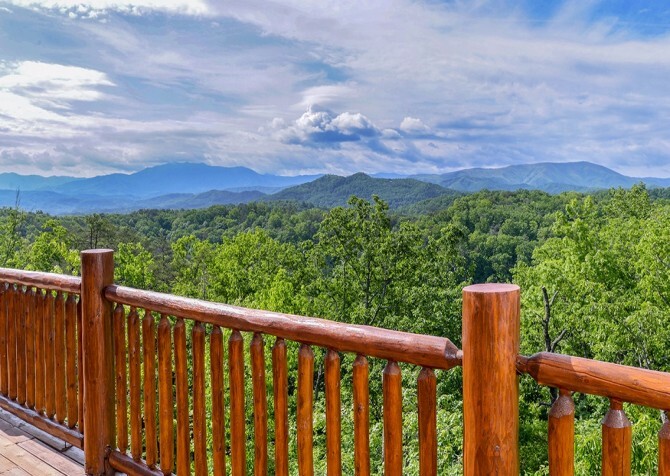 You can visit Dollywood, Cades Cove in the Great Smoky Mountains National Park, or Ripley’s Aquarium of the Smokies for a memorable time with friends and family. Just make sure you have a comfortable place to retreat to at the end of each fun-filled day—a place like the living room inside Awesome Views Mountain Retreat! 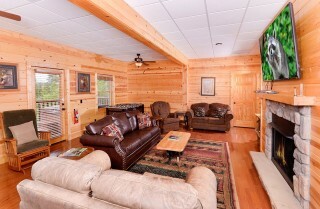 This large, open-concept space features high ceilings and large windows to let in tons of natural light. These windows also offer sweeping views of the Smokies right from the comfortable couches inside Awesome Views Mountain Retreat. 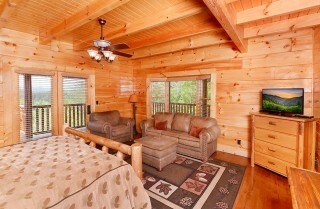 Three red leather sofas are found in this cabin’s living room, including 2 loveseats and a full-size couch in between. 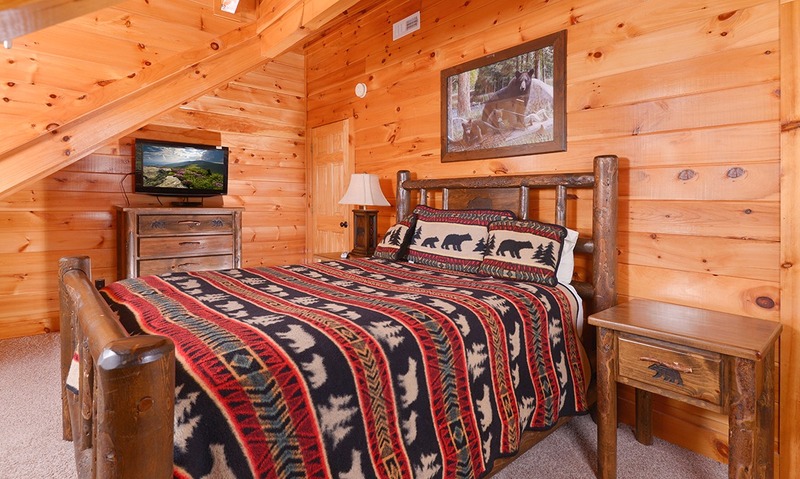 There’s also an oversized chaise in the corner, where you can kick off your shoes and relax after a long day of hiking in the national park or walking around downtown. For entertainment, switch on your flatscreen TV found in the Awesome Views Mountain Retreat living room or gather around the large coffee table for board games with friends. 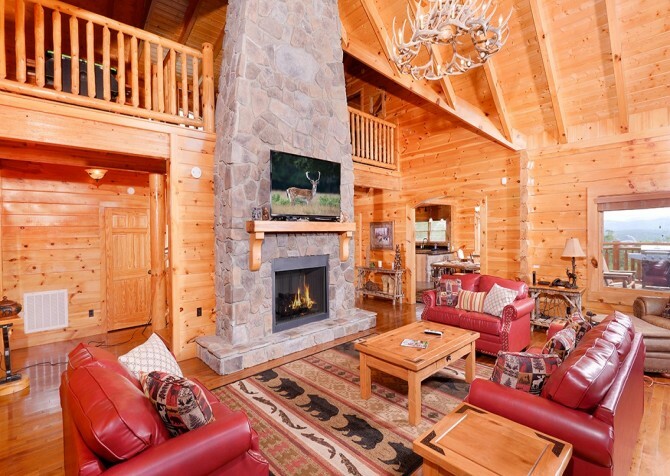 The gas fireplace surrounded by stacked stone reaching all the way to the ceiling is the focal point of the living room, offering a cozy place to warm up and unwind while you’re away. Just because you’ll be staying in a log cabin in the mountains doesn’t mean you have to sacrifice modern comfort and style. The kitchen inside Awesome Views Mountain Retreat can definitely attest to that with its updated tile floor, dark granite countertops, track lighting, and black-and-stainless steel appliances. 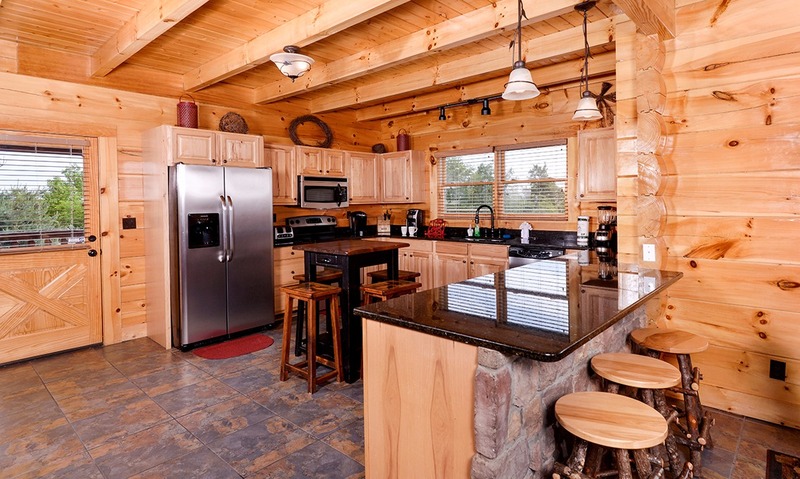 This is everything you’d expect to find in a show kitchen—though it still clings to Smoky Mountain style with natural wood cabinets and occasional stonework. Inside the large kitchen found in Awesome Views Mountain Retreat, enjoy all your major appliances as well as countertop conveniences like a blender, double toaster, and coffeemaker. 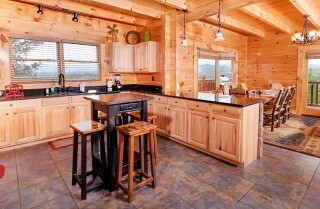 You’ll also find all the cookware, cutlery, and serving pieces necessary to make homemade meals during your stay. Dining in the cabin is a great way to save some money and keep your budget down. 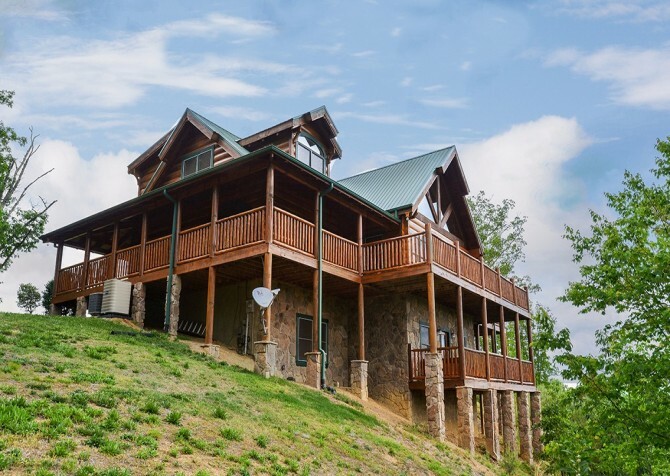 It’s also a great way to plan for private parties and celebrations if your large-group getaway is centered around a special occasion. 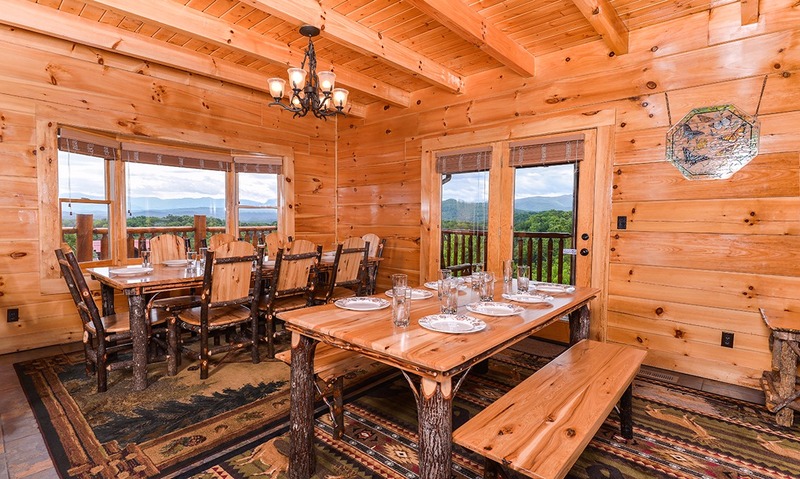 Simply choose a nearby restaurant that caters and use your cabin as the perfect place to host your get-together in the Smokies! 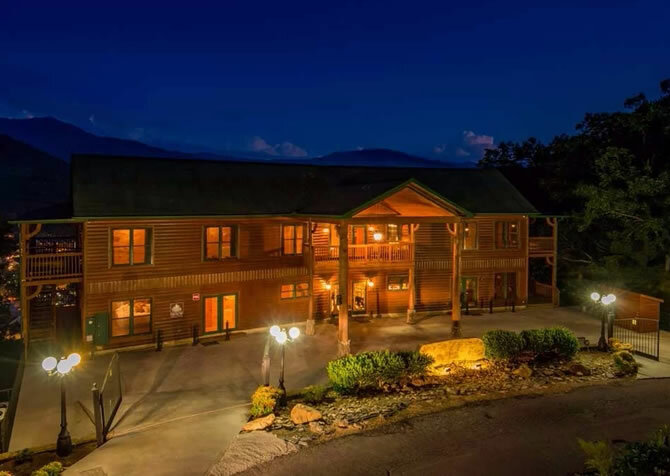 If you do host a small wedding reception, birthday bash, or work get-together during your Smoky Mountain stay, you’ll need enough room to fit all your guests around the table. At Awesome Views Mountain Retreat, you’ll be able to fit at least 25 guests for a dinner party with its 2 dining room tables (each with seating for 8), breakfast bar (3 stools), island in the kitchen (4 stools), and outdoor picnic table. The dining area itself is a beautiful space to enjoy a meal together with a bay window that peeks over the Smoky Mountain trees. Plan for pancake breakfasts in the cabin, easy lunch options like deli-style sandwiches, and family-friendly cookouts using the charcoal grill on the deck when you stay at Awesome Views Mountain Retreat. 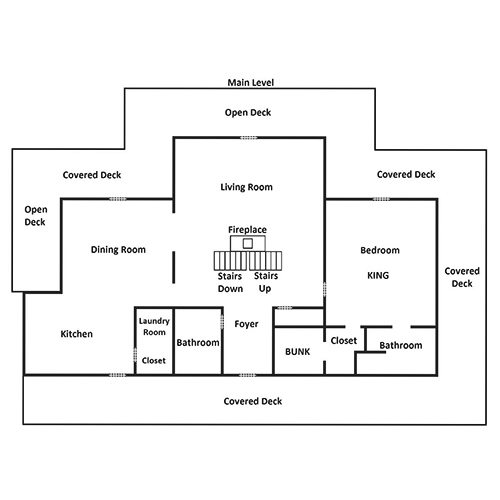 With a group as big as 25, you’ll need more than one large living area to relax and unwind. 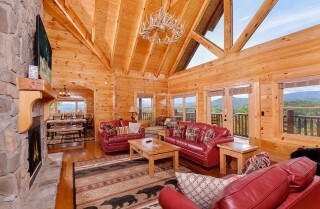 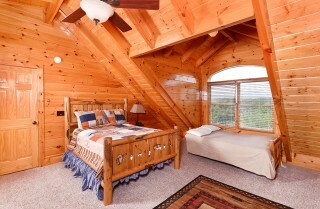 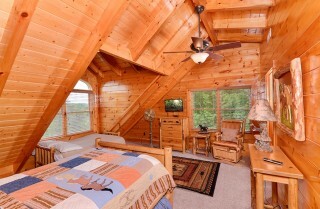 The rec room inside Awesome Views Mountain Retreat is your solution. Doubling as a cozy den, this rec space offers plenty of seating—a full-size leather couch, 3 suede loveseats, a recliner, and a plush rocking chair—as well as entertaining amenities for a good time. 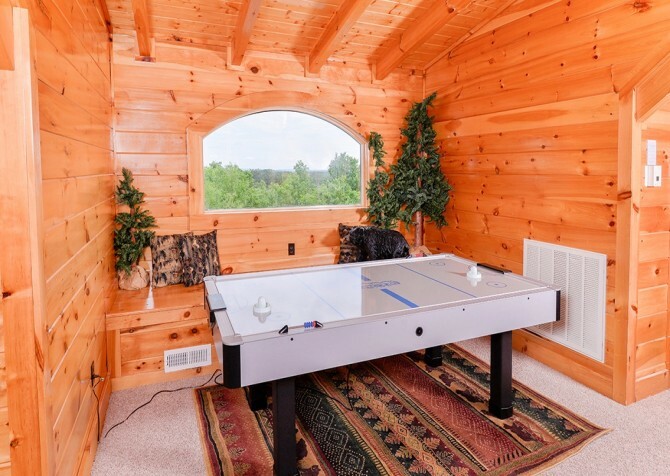 The full-size pool table is found in its own nook, so people playing a game won’t disturb those watching a different one on the flatscreen TV across the way. 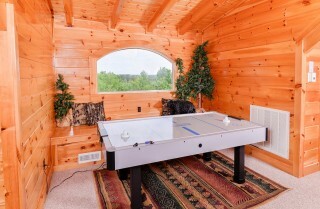 Close to the pool table, you’ll also find a wooden bench, end table, and a small round table with 2 stools. 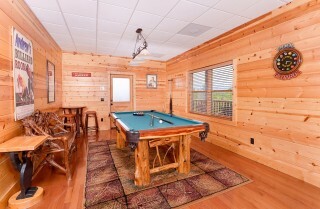 This is a great spot to relax while you wait for your shot or play a family-friendly card game with the kids. In the TV room, there’s also a foosball table, direct porch access to your outdoor hot tub, and even a wet bar with its own sink and mini fridge. 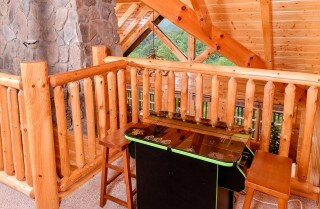 Get ready to mix up the fun at Awesome Views Mountain Retreat! 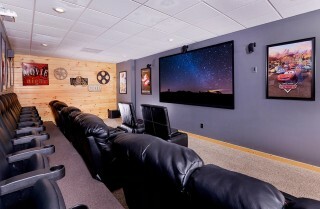 Talk about awesome: the private theater room inside Awesome Views Mountain Retreat is sure to be a favorite spot in the cabin for all your guests! 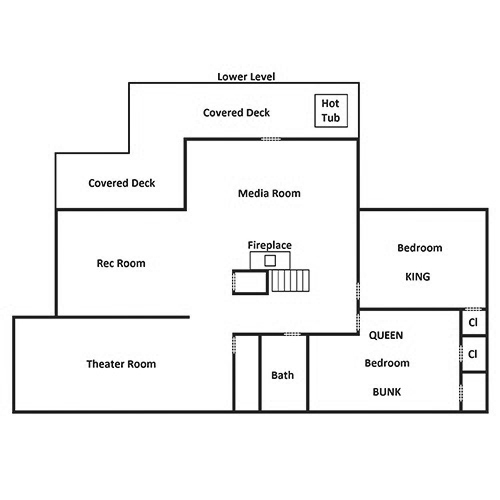 In fact, you should be able to fit all 25 of your guests in this large room, with almost enough seating for all in the theater seats with cup holders. So fix your favorite drink and a bowl of fresh popcorn, and sit back to watch a favorite DVD on the HUGE flatscreen TV mounted in this space. With movie posters and speakers all around, you’ll feel like you’ve gone downtown and watched a movie on the big screen—without the big-screen price! 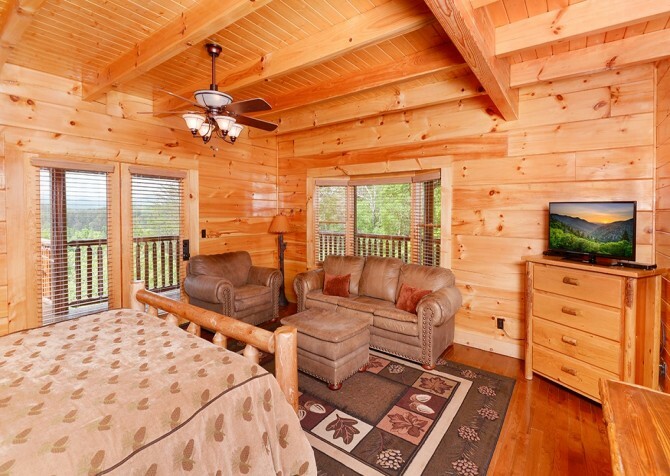 Although planning a large-group retreat to the Smokies can be difficult, a cabin like Awesome Views Mountain Retreat makes your job that much easier with its large, comfortable interior and versatile sleeping spaces. Total, this cabin will sleep up to 25 guests, but the bedrooms and various bed options allow you to mix it up as much as you need to. If you have a group full of kids traveling with you, this cabin offers 1 twin bunk, 1 twin-over-full bunk, 3 sleepers, and 1 futon. For the adults in your group, enjoy 2 king-size beds and 4 queen-size beds also found inside Awesome Views Mountain Retreat. 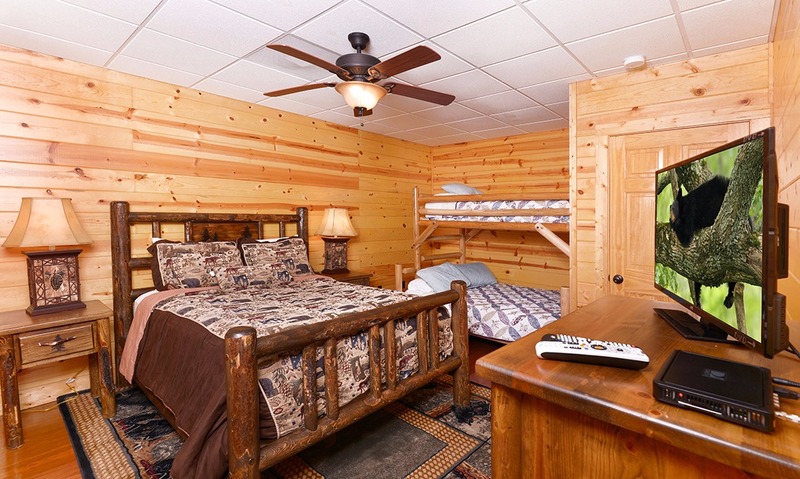 This cabin offers 7 bedrooms and 5 full-size bathrooms in all, with a TV in each bedroom (with the exception of the bunk room) along with a variety of homey amenities. 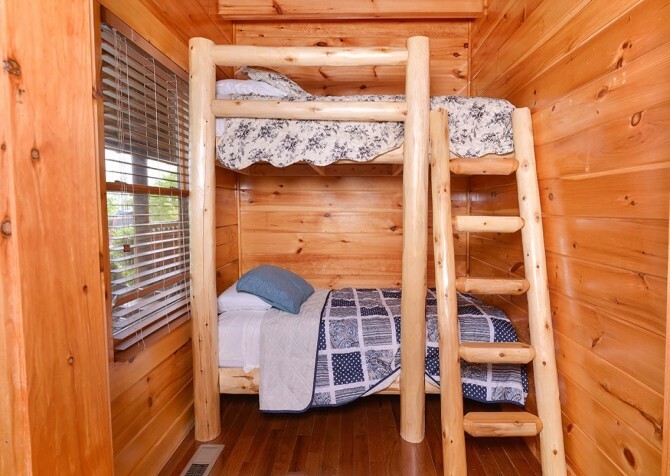 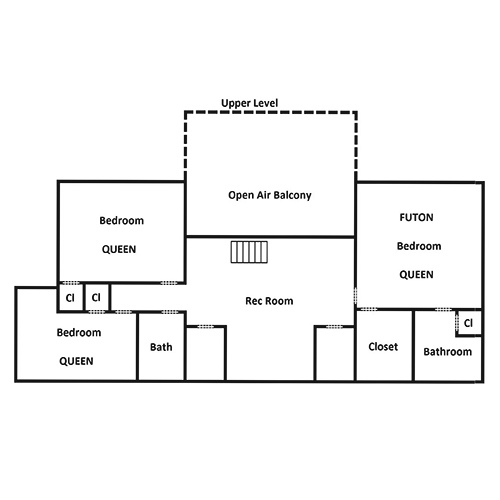 Please note that the bunk room on the main level is only accessible through another bedroom. 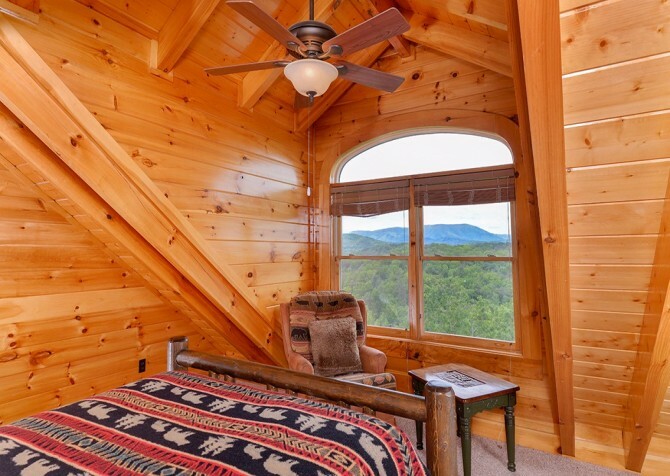 Some of the additions you can expect to find inside the Awesome Views Mountain Retreat bedrooms include ceiling fans, end tables, reading tables, sitting areas, and large windows. 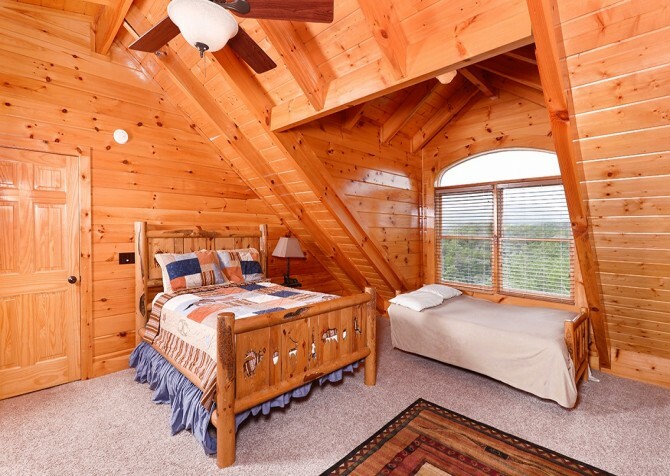 All of the bedrooms and bathrooms continue the Smoky Mountain style of the cabin with modern updates and plenty of space. If you’re planning your corporate retreat, wedding reception, or anniversary party in the Smokies because you want to celebrate amidst awesome views, then Awesome Views Mountain Retreat is the right cabin for you! 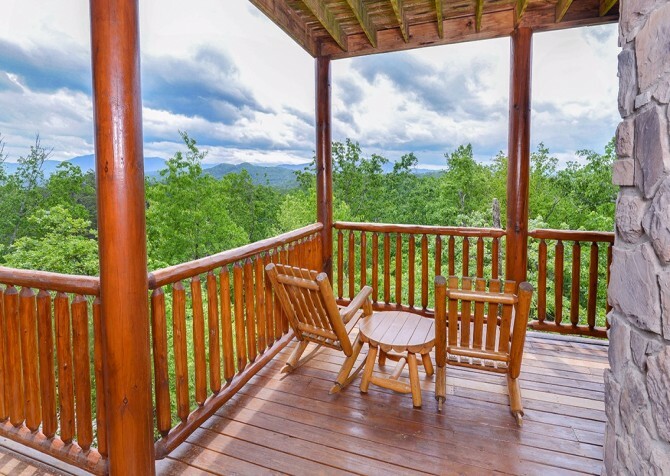 With sweeping views of the Great Smoky Mountains and plenty of porch space to enjoy them from, this cabin offers impressive mountain vistas from its semi-private locale. Several log-style rocking and stationary chairs line the decks of Awesome Views Mountain Retreat, and a picnic table – perfect for nights you use the charcoal grill at the cabin – looks out over the Smoky Mountain trees and rolling mountains in the distance. 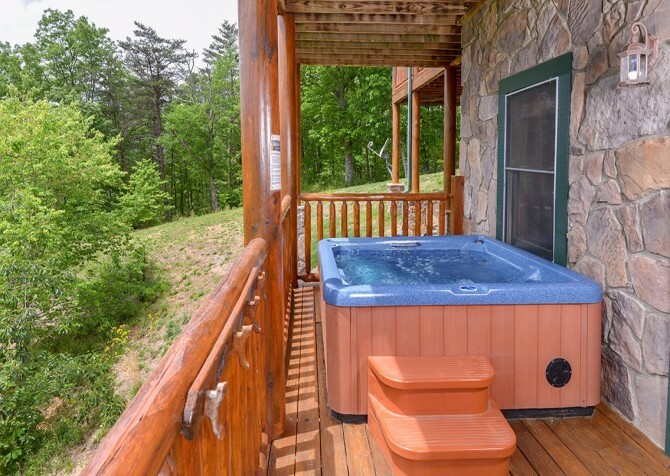 At night, guests can climb into the hot tub to unwind or gather on the new deck with a built-in wraparound bench and stacked-stone fire pit (firewood not provided). 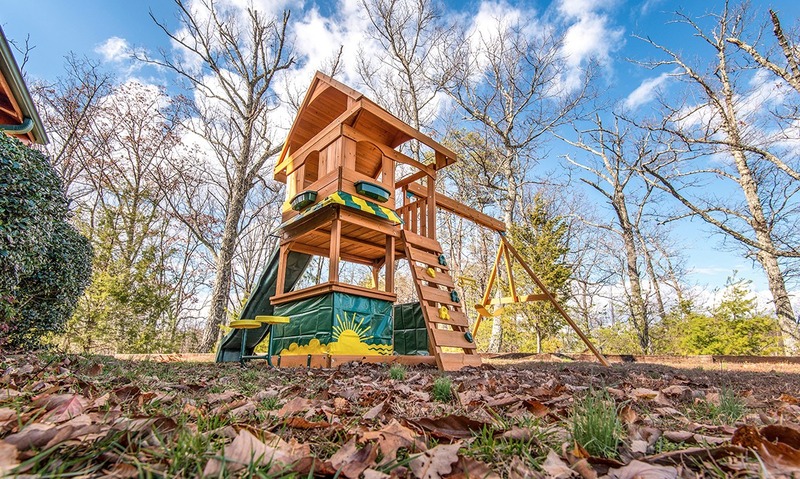 This cool cabin even boasts a new playset that the kids will love! 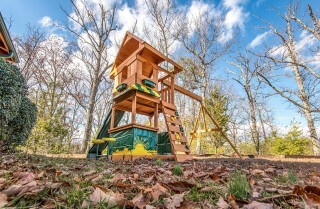 With swings, a climbing wall, a slide, and a playhouse with a “café,” it will mean hours of outdoor fun at the cabin. 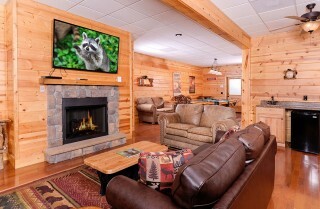 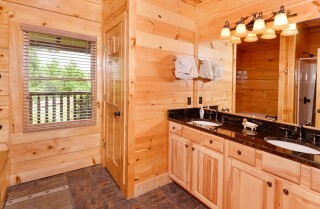 When you book a getaway for up to 25 guests, you need a cabin that’s not only large, but full of ways to have fun. 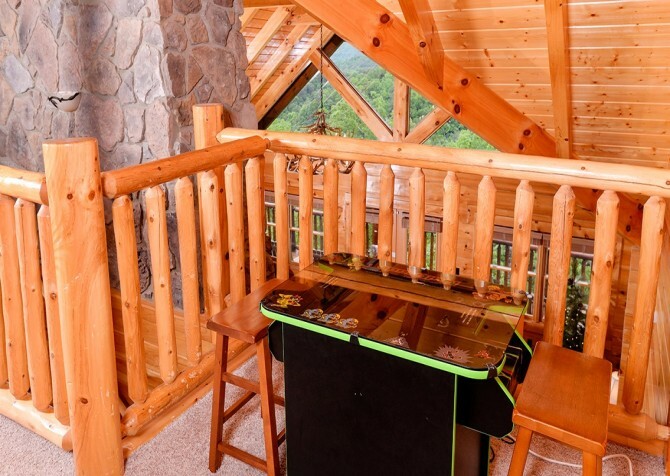 Besides the theater room, rec room, and outdoor amenities already provided by Awesome Views Mountain Retreat, this cabin also features an arcade table, air hockey table, and high speed wireless internet for streaming movies or games. 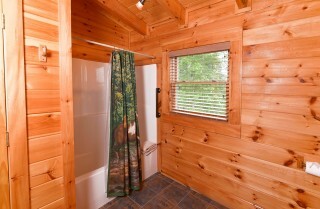 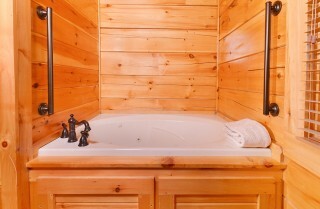 There are also multiple ways to relax with the indoor jetted tub found inside this cabin. 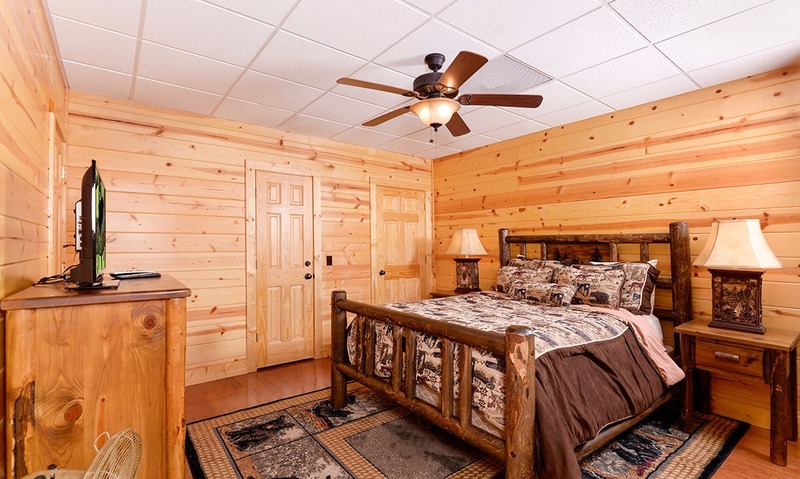 And to top it all off, you won’t miss the comforts of home like a washer and dryer and a motorcycle-friendly driveway when you stay at Awesome Views Mountain Retreat. 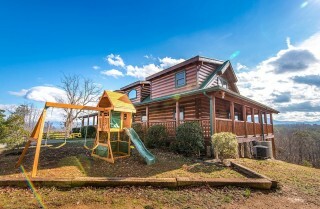 This cabin has everything you wanted in Pigeon Forge – and then some! If you’re looking for a slick ride in the Smoky Mountains, try the fast lane at The Track in downtown Pigeon Forge. This family-friendly attraction features laser tag, arcade games, and, of course, go karts! 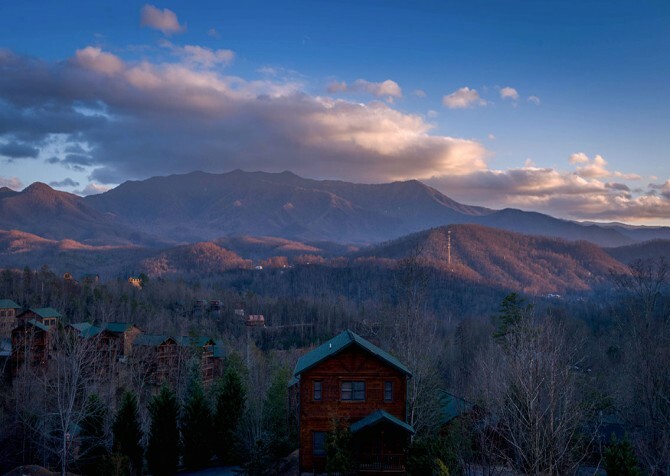 See the Smoky Mountains in a brand new way on the Smoky Mountain Alpine Coaster. 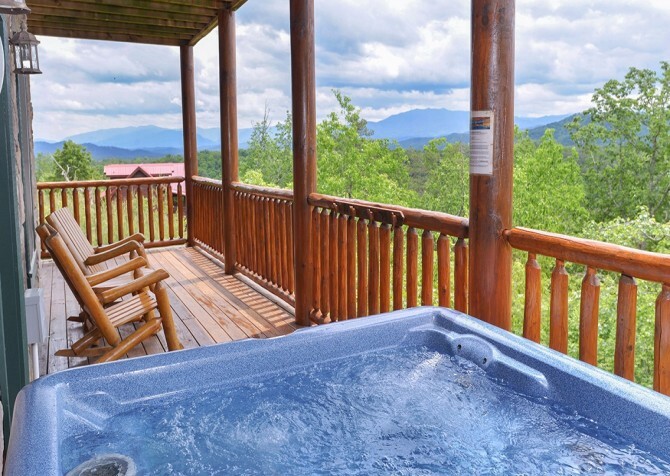 The ride is yours to control with individual hand brakes, and the up-close views of the mountains are one-of-a-kind! 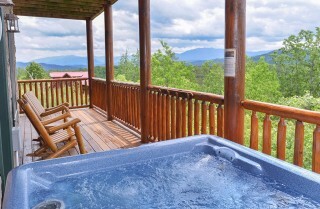 For those bringing a group to Pigeon Forge in the summer, you’ll need a fun way to cool down. 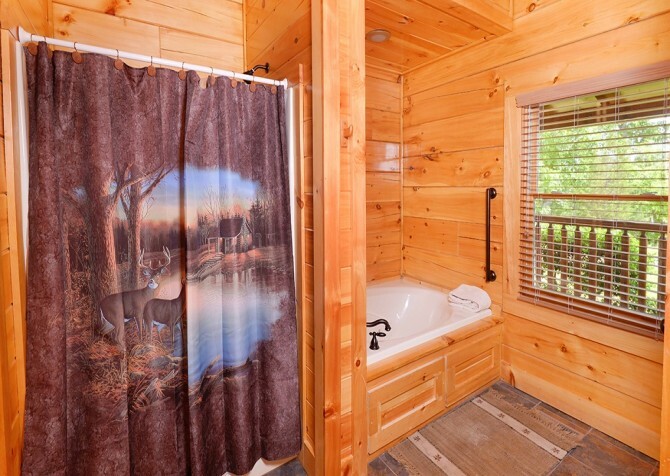 Dollywood’s Splash Country is just your answer with water slides for all ages, a wave pool, and so much more! "Awesome views was right! Truly private, gorgeous vistas from every window. 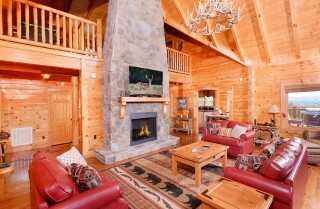 This was the best place to unwind we’ve ever visited. 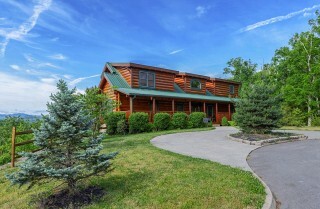 The house was even better in person than online. 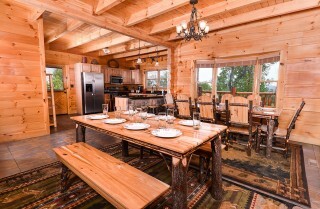 Our family especially loved being able to eat together. The kids stayed entertained the whole…"
"Awesome views was right! 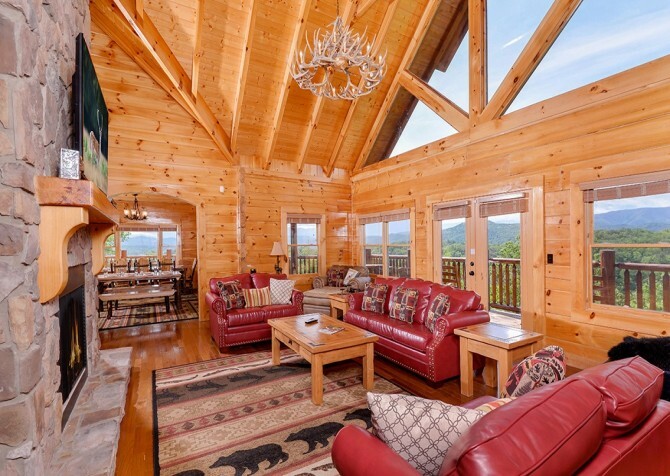 Truly private, gorgeous vistas from every window. This was the best place to unwind we’ve ever visited. The house was even better in person than online. 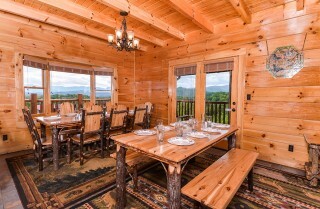 Our family especially loved being able to eat together. 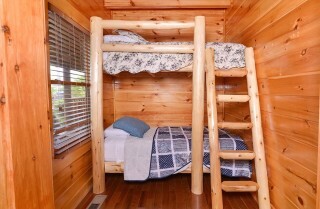 The kids stayed entertained the whole stay and we hiked n the mountains right from the Cabin. 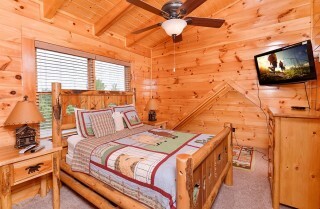 We definitely recommend this place to vacation." 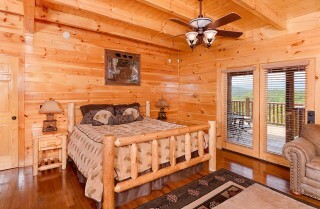 We are thrilled you enjoyed your stay with us and even more so at Awesome Mountain Views Retreat! We are happy to hear that your kids stayed entertained and that you and your family enjoyed the wonderful mountain views. Thank you again for taking the time to leave us such a great review. 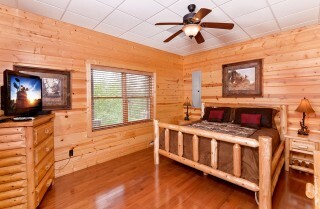 We look forward to serving YOU again. 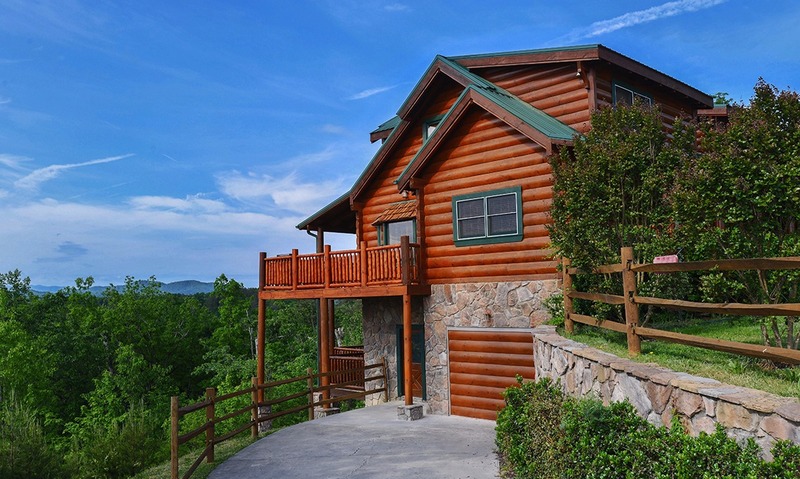 "Our family enjoyed a week long family reunion in Awesome Views Mountain Retreat. It was the first cabin vacation for us and the cabin exceeded our expectations. 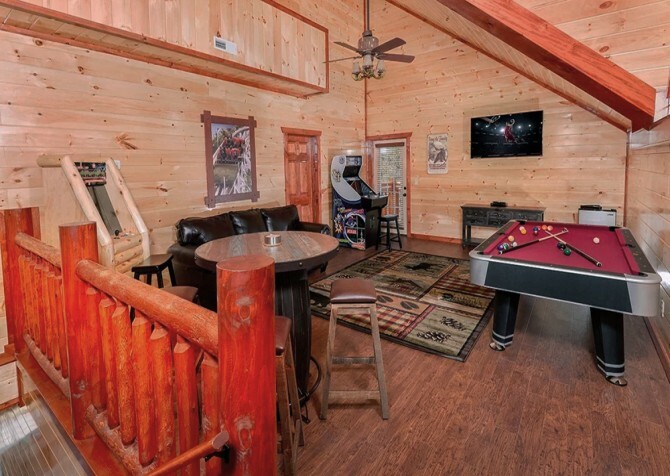 There were plenty of features in this cabin to keep us entertained including the movie theater, pool table, air hockey, arcade game and hot tub. We stayed late Oct/early Nov and the Smoky Mountains were absolutely beautiful. We even enjoyed a beautiful nature trail walk right from the property. We found Cabins For You to be quick to respond to any questions we had and they were very easy to work with from the planning stage to the end of our vacation. 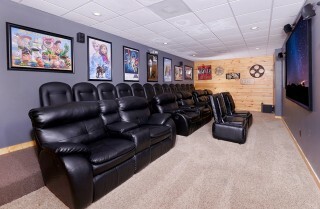 We would not hesitate to rent through them again!"